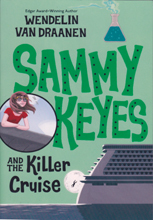 Sands delivers an entertaining performance in the latest installment of the Sammy Keyes series. Teen sleuth Sammy is on a cruise to celebrate her fourteenth birthday and to get to know her newly discovered rock-star father. Before either the celebrating or the bonding can begin, Sammy and her best friend, Marissa, get tangled up in a mystery involving two missing members of a superrich family. Sands is the first-person voice of Sammy and plays it to perfection. Her voice is youthful, and she gives Sammy the wry and sardonic tone you’d expect of a young detective. Other characters get unique voices that are effective, including one character with a shaky but passable Kenyan accent. The beginning and end of each disc are announced over background music, but the production is otherwise free of music or sound effects. This fast-paced and funny mystery will delight young listeners.